Warning: there are massive spoilers ahead for The Walking Dead‘s midseason finale! For weeks, The Walking Dead has tried to fool casual fans into believing that the walkers were “evolving.” Readers of the comic already knew the truth: the Whisperers have arrived, and they’ve claimed first blood. Jesus was the first to fall in the Whisperer war, but he probably won’t be the last. 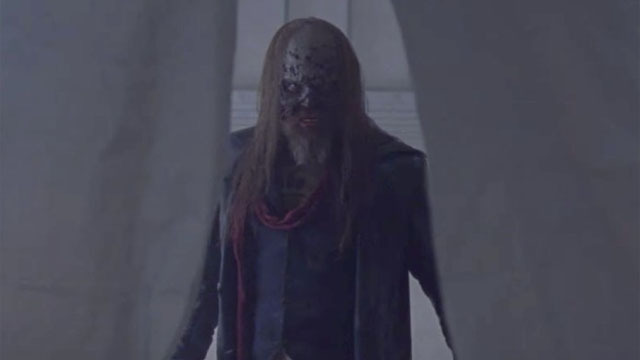 Daryl may have given us the Scooby-Doo moment of the year by unmasking the Whisperer beneath a walker’s skin. But the Whisperers are legitimately dangerous, and they could bring down the new world before it really begins. AMC has dropped the first trailer for the back half of The Walking Dead season 9. Within this footage, we see the first glimpse of Alpha (Samantha Morton) and Beta (Ryan Hurst), the leaders of the Whisperers. It also marks the debut of Cassady McClincy as Lydia, Alpha’s daughter. Apparently, the Whisperers have their eyes on Daryl. And if they can’t recruit him, then they’ll try to eliminate him. Jesus’ death also raises the issue of who will succeed him as the leader of Hilltop. Tara may be the most likely choice, since he was essentially delegating his job to her. However, Tara and Michonne have a pretty frosty relationship at the moment. Even within the new trailer, Michonne shows a willingness to let the other communities fall as long as Alexandria survives. And then there’s Negan. The former leader of the Saviors is once again a free man, and he returned to his old stomping grounds in the closing moments of the trailer. Needless to say, he’ll be playing a big role in this story as well. The Walking Dead season 9 will resume on Sunday, February 10. What did you think about the midseason trailer? And are you looking forward to the Whisperers’ next move? Let us know in the comment section below!